If we were having coffee, I would greet you with an Easter wish. The weekend has been busy so far and today I am able to slow down a little. I am feeling quite tired at the moment as I did not have too much sleep last night. My husband and nephew are working tomorrow (Monday), so we decided to have our Easter get together on Saturday evening. That way, we could socialise until late – which is exactly what we did! If we were having coffee, I would tell you that I decided to cook one of my husband’s favourite meals for dinner yesterday evening. The meal is a chicken dinner from my French cooking recipe book. I cook the chicken in white wine and add mushrooms and tomatoes in addition to the herbs. It is delicious with rice and a salad. To go with the meal, we had a South African wine that my nephew had found near to where he lives. For dessert, I tried my hand at making mini milk tarts (a South African dessert). They went perfectly with the fruit and cream. If we were having coffee, I would tell you that I did not spend all day Saturday cooking and getting ready for our family dinner. I also spent some time reading. I am currently on track for the book pledge (I have pledged to read 75 books this year). 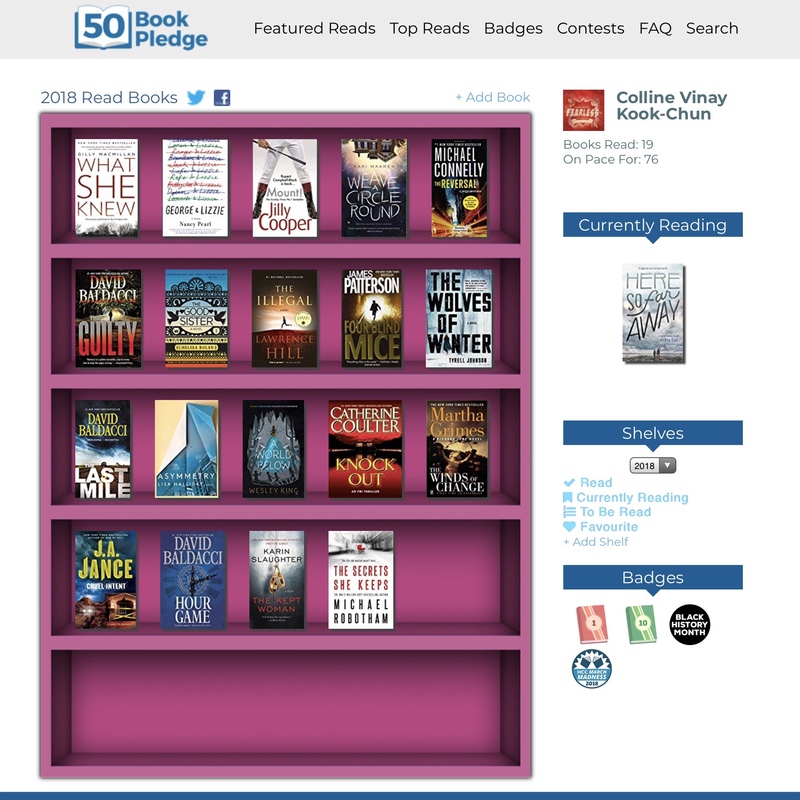 It is interesting to see my progress on the 50 Book Pledge website – I love how the books are lined up on a ‘shelf’. If we were having coffee, I would tell you that my week at work leading up to the Easter weekend was pleasant. I still had three children missing from my class as they were still on vacation. It is a pity as they missed a part of the inquiry that we are doing which children normally enjoy. I enjoy this part too as I like seeing how creative my students can be when they build with blocks. In the upcoming week, the children will have even more opportunity to build – with blocks and with wood. Hopefully all of the students will have come back from any family vacations. If we were having coffee, I would tell you to enjoy the rest of your weekend – and to not eat too much chocolate! Your Easter meal sounds really delicious, Colline and the mini melkterts look amazing. Sounds like a really good Easter celebration. It was Robbie. And I am slowly getting the milk tarts right – just a little bit more practice is needed. How I missing being able to go to the supermarket and buy one! Thank you Mihrank. May you and your family also have a wonderful Easter. Your Easter dinner sounds delicious! Flagstone is one of my favorite wines and your milk tarts, or melktert, as we call them in South Africa, look scrumptious. It is not too easy to find South African wines here – and when we do, we grab them. As for the milk tart – I grew up on them and have been trying to mimic the taste ever since I have moved from home. Happy Easter, Colline 🙂 🙂 Sounds like a lovely weekend. Thank you Jo. And to you too. So many lovely things in this post. Thank you for sharing. My children were exactly the same. As long as they lived at home they expected me to hide eggs. Yesterday I hid eggs for the first time for my granddaughter. What a treat that must have been. I always enjoyed their squeals of delight when they found the eggs. That chicken meal sounds delicious! Weekend turned out to be lower key than normal for us – which is a good thing. Hi Colline – I wanted to reach you immediately and let you know I saw several spambot on this post that like the comments that was made. I highly recommend you block them or remove them!!! Thank you Mihrank. Unfortunately I cannot figure out how to remove them. I have reported them to WordPress though. It was Norah. It is one of my family’s favourite dishes.